This is an excellent question and one that bears addressing. The reader brings up a valid point. I have often addressed this question in the past with other people in various forms of social media with varying degrees of success; success being determined by how much that person clung to church orthodoxy being the authority that determined his version of truth for reality. But I don’t think I have ever addressed the question in an actual blog post. Contradictions (paradox,”mystery”) occur whenever we have incompatible assumptions. The way church orthodoxy handles this contradiction is to re-interpret 1:John 3:9 and insert the word “practice” which is not the word used in the manuscript. Notice that because of the church’s orthodox assumption of righteousness by perfect law-keeping, the ESV interpretation holds out the possibility for believers to keep sinning and thus the need for continual forgiveness of present sin as referenced in 1 John 1:9. I have written a comprehensive article on this subject here. While John is writing to believers, he is addressing a larger issue, specifically, a sect of gnosticism that had made its way into the assemblies by some false teachers. This particular brand of gnosticism divided man into spirit and flesh and that any time man “sinned” he only did so in his flesh, but his spirit was unaffected. 1 John 1:9 is only part of a larger argument John is making to refute this idea. Paul addressed this historical context in this series of articles beginning here. The apostle John is actually presenting a series of rhetorical arguments against this brand of gnosticsm. A close inspection of the grammatical structure of verses 6 through 10 reveal the hypothetical nature of his arguments. At right, here is a screen shot from my interlinear Bible software. 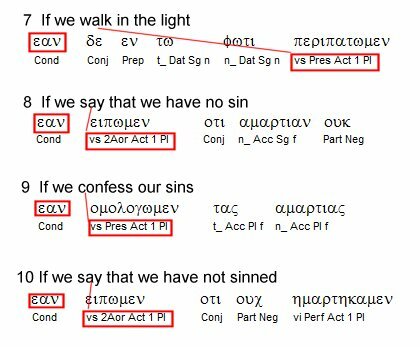 Notice that in the Greek, verse 6 begins with the conditional word “εαν” and the accompanying verb in the “subjunctive mood.” You don’t need to know the technical details of all this, but what is important to know is that this structure is called a 3rd Class Condition. In Greek, 3rd class conditions are used to present rhetorical or hypothetical arguments. If you look at the grammatical structure of verses 6 through 10 you will see they all begin with this same structure for a 3rd class condition. So in this case, verses 6 through 10 deal with true biblical JUSTIFICATION set against the gnostic idea of justification. John is not saying that this is something that believers need to do all the time. He is not stating that this is the present state of believers. In other words, “we” is not a reference to believers but rather “we” in a general, non-specific sense. He is showing why the gnostic idea of justification is false, and he is doing so in a very methodical, logical argument using these five rhetorical statements. Understood in this context, this passage no longer contradicts 1 John 3:9. Having presented the need for justification and how it compares to gnostic doctrine, John goes on to make the case that believers are justified because they have been born again. John understood that because the new creature is God’s offspring, righteousness is not a matter of sinning or not (ie. Law). Righteousness is a state of being by virtue of the fact that they are born of God! Sin has to do with condemnation. Believers don’t “sin” because they are no longer under the law’s condemnation. Where there is no law there is no sin. And once you start thinking about it rightly, why would you need further confession of “sin” if 1John 1:9 cleanses you, or washes you of ALL unrighteousness? A word study on “ALL” would be interesting. This fits with Jesus telling Peter that he had been washed once and was in no further need of a cleansing. This lines up with Jesus telling the woman at the well that she only needed to drink the water once and would never thirst again. This makes sense even on a first-take grammatical level if you are looking at it with the proper presupposition, viz, salvation is a one time and for all time event. Then, the rest of the chapter fits together perfectly. Yes, clearly, first John speaks to the individual salvation event. Other than the Gnostic theory, John could have been addressing doctrines that taught that the initial salvation event does NOT cleanse from all unrighteousness and a progressive righteousness is needed. In overall context, he could have been arguing against a soteriology that is exactly that of church: the idea that sin is only covered and not ended. A rereading of 1John with that understanding may make it surprisingly clear.